Thanks to Judy Robbins, Let Cuba Live, the Maine Committee in Solidarity with Cuba, and Arnold August, Montreal-based journalist. lecturer, and author three books, for passing along the two speeches Miguel Díaz-Canel Bermúdez delivered on September 26 at the opening of the 73rd Session of the UN’s General Assembly, the first to celebrate and promote the international day for the complete elimination of nuclear weapons. Both are printed below. On Sunday, September 30th WBAI/Pacifica Radio in New York City broadcast excerpts of Harlem’s Community Welcome for The Cuban President – including his spirited address to the packed Riverside Church and a surprise visit by Venezuelan President, Nicholas Maduro. The show is available to listen to and/or download in the WBAI archives here. We reject the decision of the US Government to withdraw from the Joint Comprehensive Plan of Action (JCPOA) or the Iran Nuclear Agreement. The non observation of these international commitments goes against the rules of coexistence among States and will have serious consequences for stability and security in the Middle East. It is impossible to be here, speak from this rostrum on behalf of Cuba, and not recall historic moments of the General Assembly which are also part of our dearest memories: Fidel Castro, Che Guevara, Raul Castro and the “Chancellor of Dignity”, RaCil Roa, just to mention the most significant, [who] have brought here not only the voice of our people but also the voice of other Latin American and Caribbean, African, Asian, non-aligned peoples, with whom we have shared more than half a century of struggles for a fair international order, which is still far to be attained. These realities. Madam President, are not the result of socialism, like the President of the United States said yesterday here. They are the consequence of capitalism, especially imperialism and neoliberalism; of the selfishness and exclusion that is inherent to that system, and of an economic, political, social and cultural paradigm that privileges wealth accumulation in the hands of a few at the cost of the exploitation and dire poverty of the large majorities. Capitalism consolidated colonialism. It gave birth to fascism, terrorism and apartheid and spread wars and conflicts, the breaches of sovereignty and self-determination of the peoples; repression on workers, minorities, refugees and migrants. Capitalism is the opposite of solidarity and democratic participation. The production and consumption patterns that characterize it, promote plundering, militarism, threats to peace; they generate violations of human rights and are the greatest danger to the ecological balance of the planet and the survival of the human being. No one should be deceived by anybody claiming that humanity lack enough material, financial and technological resources to eradicate poverty, hunger, preventable diseases and other scourges. What is lacking is the political will of the industrialized countries, who have the moral duty, the historical responsibility and the abundant resources to solve the most pressing global problems. The truth is that while it is claimed that there is a shortfall in funding to attain the goals and targets of the 2030 Agenda or address the increasing impact of climate change, 1.74 triilion dollars were wasted in military expenditure in the year 2017, the highest figure since the end of the Cold War. Climate change is another unavoidable reality and a matter of survival for the human species, particularly for Small Island Developing States. Some of its effects are already irreversible. Scientific evidence indicates there is an increase of 1.1° C relative to pre-industrial levels, and that 9 out of 10 persons living in urban areas breath polluted air. In addition, and like there were not enough threats on humanity and its dazzling creations, it is a fact that the military and nuclear hegemonism of imperialism is perpetuating itself and expanding to the detriment of the hopes of the majority of peoples for a general and complete disarmament. Cuba shares this ideal and, as testament of its commitment with this goal, on last 31 January, it became the fifth State to ratify the Treaty on the Prohibition of Nuclear Weapons. Against that logic, the threat or use of force, unilateralism, pressures, retaliations and sanctions which increasingly characterize the behavior and rhetoric of the US government and its abusive use of the veto power in the Security Council in order to impose their political agenda, pose huge challenges and threats within the United Nations itself. Today we have come to reiterate what Commander-in-Chief Fidel Castro Ruz said on the occasion of the fiftieth anniversary of the UN, which summarizes the most noble aspiration of the majority of the humanity, and I quote: “We want a world without hegemonistic practices, without nuclear weapons, without interventionism, without racism, without national or religious hatred, without violations of the sovereignty of any country, with respect for independence and the free self-determination of peoples, without universal models that do not take into account the traditions and cultures of all components of humanity at all. Without cruel blockades that kill men, women, children, the young, and the elderly like silent atomic bombs”. Our America is currently the stage of persistent threats, inconsistent with the “Proclamation of Latin America and the Caribbean as a zone of Peace”, signed in Havana by the Heads of States and Government on the occasion of the 2nd Summit of the Community of Latin American and Caribbean States, in 2014. The current US administration has proclaimed the relevance of the Monroe Doctrine and, in a new deployment of its imperial policy in the region, is attacking Venezuela with special cruelty. It is in this threatening context that we wish to reiterate our absolute support to the Bolivarian and Chavista Revolution, the civic-military union of the Venezuelan people and its legitimate and democratic government, led by the constitutional president Nicolas Maduros Moros. We reject the intervention attempts and sanctions against Venezuela, aimed at suffocating her economically and hurting the Venezuelan families. We likewise reject the attempts at destabilizing the Nicaraguan government, a country of peace that has made a remarkable social, economic and public safety progress in favor of its people. We reiterate our unrestricted support to a comprehensive, just and lasting solution for the Israeli-Palestinian conflict, on the basis of the creation of two States, allowing the Palestinian people to exercise their right to self-determination and to have an independent and sovereign State based upon the pre-1967 borders, with East Jerusalem as its capital. We reject the unilateral action of the United States to establish their diplomatic representation in the city of Jerusalem, which heightens even more the tensions in the region. We condemn the barbarities of the Israeli forces against civilian population in Gaza. We support the search for a peaceful and negotiated solution to the situation imposed in Syria, without foreign interference and with full respect to their sovereignty and territorial integrity. We reject any direct or indirect intervention, carried out without the legitimate authorities of the country. The continued expansion of NATO towards Russian border is causing serious threats, worsened by the imposition of arbitrary sanctions, which we reject. The government of the US keeps an aggressive rhetoric towards Cuba and maintains a policy aimed at subverting the political, economic, social, economic and cultural system in my country. Contrary to the interests of both peoples and giving in to the pressures of minority sectors, the new US government has devoted itself to artificially fabricate under false pretexts, scenarios of tension and hostility serve nobody’s interests. This is in contrast with the fact that we have formal diplomatic relations and mutually beneficial cooperation programs in a limited number of areas. 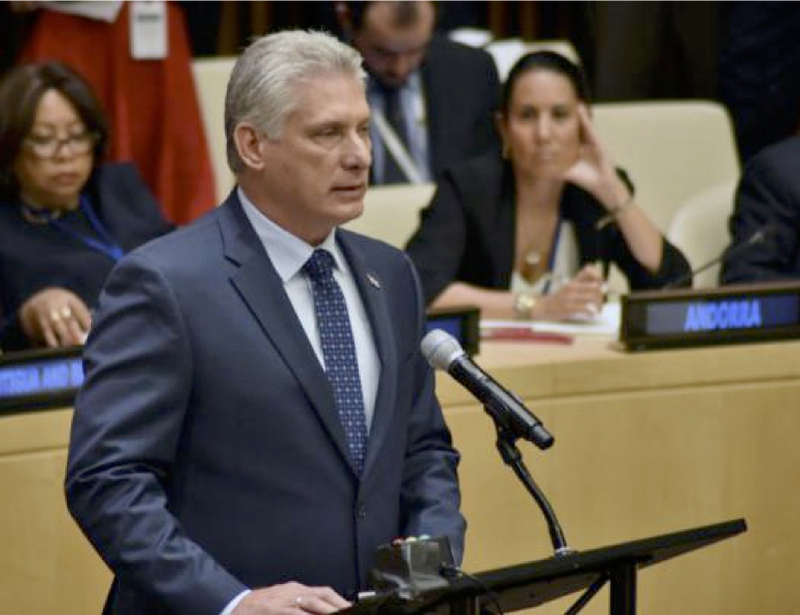 On behalf of the Cuban people, I would like to thank this General Assembly for the virtually unanimous rejection to the economic, commercial and financial blockade imposed by the United States against my country. Nevertheless, the actions of the US government against my country go farther. It includes public and covert programs of gross interference in Cuba’s internal affairs. To this end, tens of millions of dollars that are officially allocated in its budget are used, in violation of the standards and principles upon which this organization rests, and in particular, of Cuba’s sovereignty as an independent nation. Cuba stands ready to develop respectful and civilized relations with the US government on the basis of sovereign equality and mutual respect. This is the will of the Cuban people and we know this is a shared aspiration by most US citizens and, particularly, by Cubans living there. We shall continue to tirelessly demand the end of the cruel economic, commercial and financial blockade, the return of the territory illegally occupied by the Guantanamo Naval Base and adequate compensation to our people for the thousands of dead and disabled and for the economic and property damages caused to Cuba over so many years of aggression. Cuba will always be willing to engage in dialogue and cooperate on the basis of respect and equal footing. We shall never make concessions affecting the sovereignty and national independence, we shall not negotiate our principles nor shall we accept conditionalities. The generational change in our government should not raise the hopes of the enemies of the Revolution. We are the continuity, not a rupture. 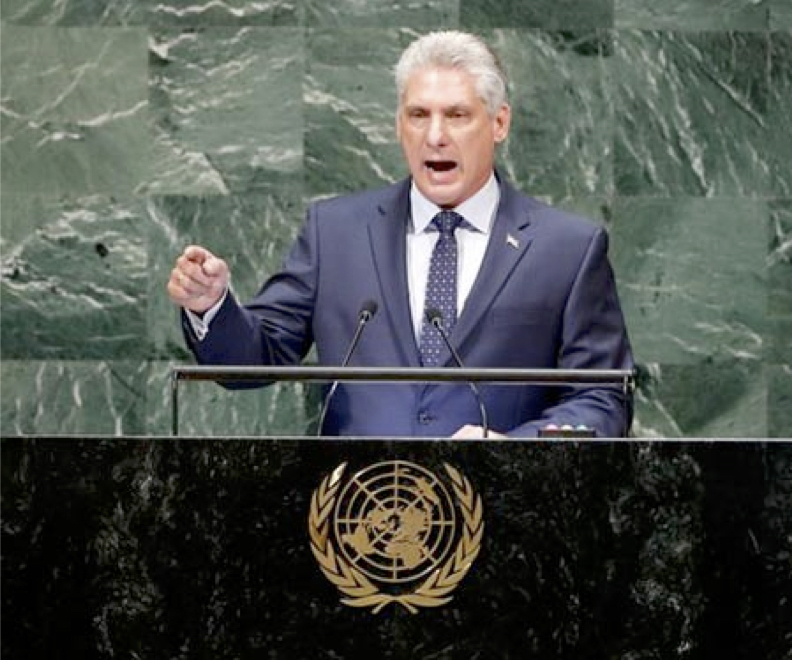 Cuba has continued taking steps to improve its model of economic and social development in order to build a sovereign, independent, socialist, democratic, prosperous and sustainable Nation. This is the path that our people has freely chosen. The principles of foreign policy will remain unchanged. As the First Secretary of our Party, Raul Castro Ruz, said on his statement on the occasion of the 70 anniversary of the United Nations, and I quote: “The international community will always be able to count on the Cuba’s sincere voice against injustice, inequality, underdevelopment, discrimination and manipulation; and for the establishment of a fairer and more equitable international order, whose center is placed, really on the human being, its dignity and well-being”. The Cuba on behalf of which I speak today is the proud successor of that independent, sovereign, fraternal and solidarity policy with the poorest of this world, producers of all the wealth in the planet, although the unequal global order has sentenced them with dire poverty on behalf of words like democracy, freedom and human rights, words which the rich have actually emptied of meaning. It has been exciting and pleasant to take the floor at the same rostrum from which Fidel expressed powerful truths 58 years ago, that still continue to shake us in front of representatives of more than 190 nations who, rejecting extortion and pressures, every year fill the voting screen of worthy green lights of approval to our demand for the end of the blockade. I bid you farewell in the hope that the noble aspirations of most of the Humanity will be achieved before younger generations take this rostrum to demand the same as we do today and our historic predecessors did in yesteryear.